All wild birds will go wild for this feed and no mess! 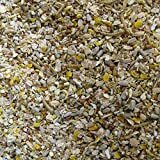 20kg Supreme Wild Bird food with Aniseed Oil A great all round four seasons mix. The Aniseed oil helps to attract even more birds to the bird table. For a good source of energy, blend with striped and black sunflowers. Ingredients: Wheat, Chopped Maize, Red Dari, Striped Sunflower, Red & White Millet, Black Sunflower, Chopped Nuts, Micronized wheat, Buckwheat, Hempseed, Aniseed Oil, Soya Bean Oil. This entry was posted in Birds and tagged 20kg, Bird, Food, Free, included, Insects, ONLY, Sack, Superior, Wild by One Boutique. Bookmark the permalink.